Shopbop is having its Friends & Family sale this week. You can get 25% almost everything - use the code INTHEFAM. It is a great time to buy those things you have wanted to get - but wanted to wait until they went on sale. Shopbop offers free shipping both ways - so there is no additional cost. I always look for places that offer free shipping - especially free return shipping. If you are not careful - shipping costs can add up. So, it is best to find the places with free shipping. Nordstrom is another place I like to shop that offers free shipping both ways - or you can even pick it up in the store. 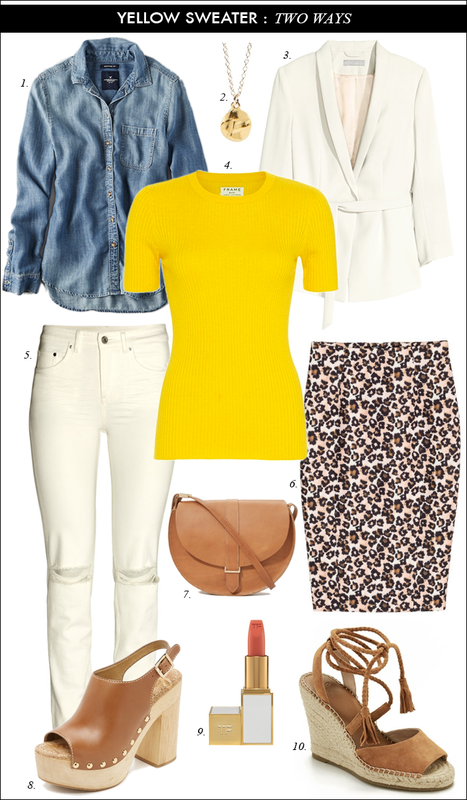 As you may have noticed in my look yesterday - I like to pair leopard with yellow. It depends on the shade of the leopard print - but in most cases, I think it works really well. Denim is also a nice layering piece to add to the look. Be sure to stop back tomorrow. I will be back with the women from The Blended Blog to show how we style a spring sweater. With this crazy weather (a snow storm on Saturday) - it is kind of difficult to dress for spring - but soon the snow will be gone and warmer weather will be here for good. Lastly, my husband and I are in the process of updating some furniture and possibly remodeling our kitchen. (Oh how I would love to remodel our kitchen.) We have lived in our house almost 15 years - and it is time for a make-over. It is funny how all of sudden - things feel "old". I just bought this table yesterday. It will be here in a couple of weeks. And now, I am in the process of picking out the chairs and upholstery. (Only bad thing is that the chairs will take at least 10 weeks to arrive.) I may take a deviation from styling outfits a few days - and show some room updates instead. Loving that fun colorful sweater and how you layered it with the leopard! Cute look! That yellow sweater!! Love it! Yes to room updates! And I have been loving all of the yellow and leopard you've been pairing...although yellow isn't the best color for me, looks great on you! I love seeing room updates! Especially before and afters. It's always fun to see how other people decorate! I love leopard and yellow together. Such a great combo!! I love it! I love that cute bag!